What makes some stock option premiums worth so much more than others? Let’s say we have two stocks, A and B. Both are trading @ $25/share. We look to sell the same month at-the-money $25 strike and one (stock A) returns 2% and the other (stock B) 4%. WHY? The answer lies predominantly in the mysterious world of implied volatility (IV). The volatility of an option reflects the forecasted fluctuation in the price of the underlying stock, both up and down. It does NOT predict a trend but rather a range of price change that the equity can have. In this case, stock B has a much higher IV than does A.
Intrinsic value is the amount of money the strike is below the market value of the equity, nothing more or less. It is not affected by stock volatility or anything other than the value of the underlying security. Therefore, volatility of the stock relates only to time value. Historical Volatility (Statistical Volatility): A statistic or statement of fact based on the closing prices over the past year. If a stock has had a trading range between $30 and $40 and has an average price of $35, we can say the historical volatility is $5 in either direction. A stock that moves up or down $5 from its average of $35 is said to have an HV of 14.3% (5/35). It does not predict a future direction. Implied Volatility: This is the market’s estimate of future volatility and is based on the option’s last traded price. Stated differently, it is the volatility that the market as a whole is expecting that is giving the option premium its current value. If the historical volatility (HV or SV) is @ 14.3% and the current implied volatility is @ 30%, then that option is considered overpriced. 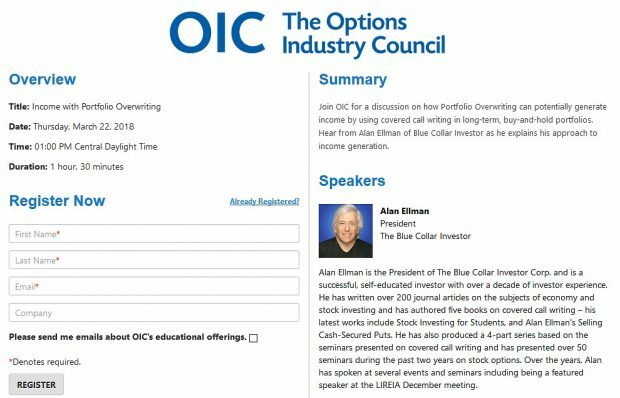 Blue Collar Investor Corp (BCI) is currently trading @ $60 per share (I wish!). A pricing model like the Black-Scholes, determines that, based on the current market value of the call option ($60 strike, for example), the IV is 25%. This means that the market is anticipating a price change of $15 (25% of $60) up or down. Remember it does not identify a trend. The expected range for the year currently is between $45 and $75 (plus or minus 25% of $60). The likelihood of this being accurate is 1 standard deviation or 68% of the time. It will fall outside these limits 32% of the time. Bottom line: When IV percentages are quoted, they are based on the current option value and on 1 standard deviation. 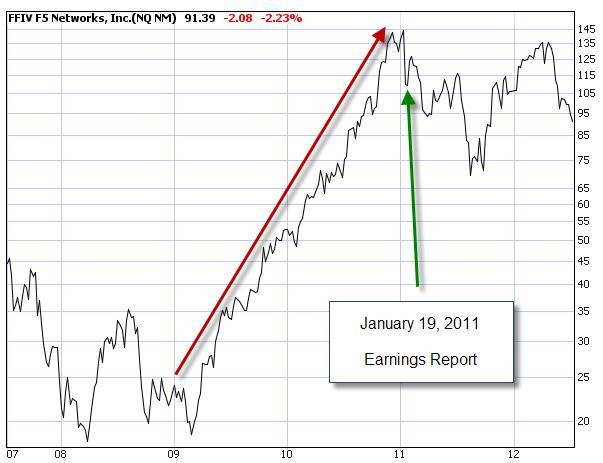 This chart was captured a few days prior to the earnings report for ADTN. It is no surprise that the IV (red arrow) is higher than the HV (green arrow) as the market is anticipating a short term price fluctuation due to a potential positive or negative earnings surprise. If a 1-month at-the-money option returns more than 6-7% the market is anticipating a large price change by expiration Friday. In most instances, I will avoid these situations and target a 2-4% return. Exceptions to this guideline include strong bull markets and the use of in-the-money strikes to hedge against potential negative price movement. For more information on strike price selection, see pages 108-124 of Alan Ellman’s Encyclopedia for Covered Call Writing. Our stock option premiums consist of intrinsic value (for in-the-money strikes only) and time value. The volatility of the underlying equity impacts only the time value. The greater the implied (forecasted) volatility, the richer the option premium. The direction of price movement is NOT inherent in implied volatility stats which are based on 1 standard deviation. For the week, the S&P 500 rose by 0.2% for a year-to-date return of 9.1% including dividends. How does the beta information in your weekly reports factor into this discussion of volatility? Thanks. Beta should be used as a secondary factor in stock selection. It measures systemic or market risk by comparing the historical volatility of a stock as it relates to the overall market. High beta stocks tend to outperform in bullish market environments and low beta stocks outperform in bearish markets. In our BCI methodo0logy we first screen for fundamentals, technicals, common sense principles and calculations are then evaluated. Factors like segment rank, dividend yield and beta are secondary factors to those primary ones. The Weekly Report for 07-13-12 has been uploaded to the Premium Member website and is available for download. How much weight do you give to the number of weeks a stock has been on the list? Doing any seminars in NJ anytime soon? In the past 3 months I have been the keynote speaker for presentations in New York City, Long Island and Atlanta. My next scheduled appearance is in Las Vegas at the Forex and Options Trading Expo. Information will be posted on this site later this month. I have no live appearances scheduled for NJ at this time however if you are part of a large investment group send me an email and I’ll see if we can work something out. Otherwise, follow this site as we will update event information in a timely manner. Regarding your first question, I DO give credence to stocks that have remained on our watch list for significant time periods. It is quite difficult for equities to pass the rigorous BCI screens and stocks that have done so for long periods of time definitely get my attention. One example that comes to mind is FFIV which had an incredible run of a year and a half from 2009 to 2011 as highlighted by the red arrow in the chart below. 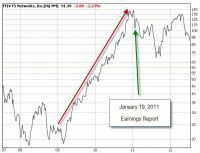 The green arrow shows when all the fun ended due to a disappointing earnings report on January 11, 2011 (yes, I was out of this position at that time!). I would consider this a secondary factor in stock selection along with the others I mentioned to Joe under comment #1 above. Click on the chart to enlarge and use the back arrow to return to this blog. The Weekly Report for 07-13-12 has been revised and uploaded to the Premium Member website and is available for download. There was a minor formatting issue that was fixed, but there is no change to the data uploaded earlier. Look for the report dated 07-13-12-RevA. Are there any other events like earning reports that can cause implied volatility to increase substantially? Recently there was a news report that Mark Cuban took a large position in a company, Veringo (VRNG). This company is merging (final approval expected this week) with Innovate/Protect which owns various patents and is in the process of litigating patent infringements with several large corporations including Google. The Google trial is scheduled for October, 2012. 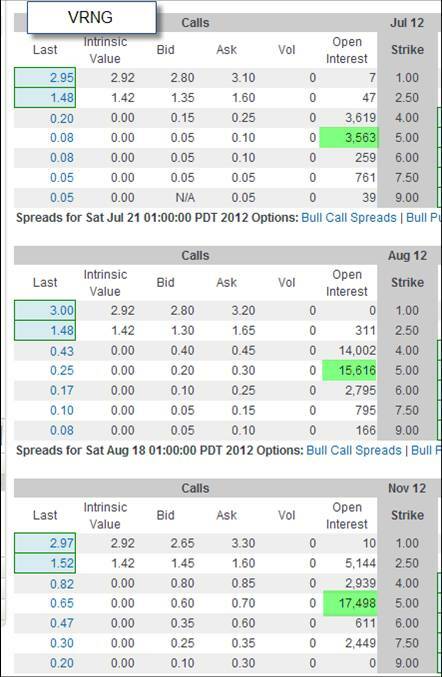 If you look at the options chain below, you will see increasing open interest through the November contracts. As we approach the trial, my expectation is that the IV of the options will increase as the market anticipates a significant price change depending on the outcome of the trial. There are many compionents to the final outcome but many investors have jumped on board before the potential increase in IV has kicked in. Click on image to enlarge and use the back arrow to return to this blog. Last month I bought 300 BWLD and sold the 80 calls. Today the stock is over 84 and there is an earnings report coming up next month. Is the best action to do nothing and have the shares sold this Saturday? I only have 1 contract but that’s exactly what I’m doing. Wish I had more. Good luck. Your approach is quite reasonable and the one I also plan to take with my positions in BWLD. For more aggressive investors who feel bullish about the upcoming report, the short positions can be closed as close to 4PM EST on expiration Friday as possible, the shares held through the report and then write calls after the report passes. If you really like the stock and want to keep it through it’s ER, you can protect it with a collar. A collar trade consists of three parts or legs. They are (1) the stock, (2) a (protective) put, and (3) a call. (1) If the stock drops, you can profit from the put…exercise the put and buy back the call. (3) If the stock goes up in price, you can sell the put for a small loss and try for a “double” on the covered call side of the trade. In any case, you have protected your stock during the ER period. Is it okay to roll our options today or is it better to wait until late tomorrow? Any help appreciated. 1- Risk of a negative surprise or poor guidance. 2- Capping the upside of a positive surprise. Today’s report is a great example for the latter. I think I know the answer to this but I want to make sure. 1) Wait to place trades until 7/25 when a lot of companies will have made their earnings announcements. 4) Wait until Monday when we have a new list and perhaps there will be some more choices. Is this the correct way to think about it? Anything else to consider? You have all of the bases covered. However, I would be careful about item #3. Alan has developed the BCI methodology over many years and not trading a stock during the month that it reports earnings is a fundamental principle. From a personal perspective, the times that I did what you called out in item #3 above, I got burned. This report is especially useful to many of our members during earnings season.